The classic Snowball, but with a seasonal makeover using coconut cream and desiccated coconut for a winter wonderland twist. 1. Shake the vodka, Malibu and coconut cream in a shaker until frothy. 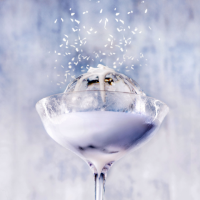 Pour into a coupe glass over an ice ball (use a special ice-ball mould) and sprinkle with coconut.